I love this time of year. I love the colors, the temperature, the food. 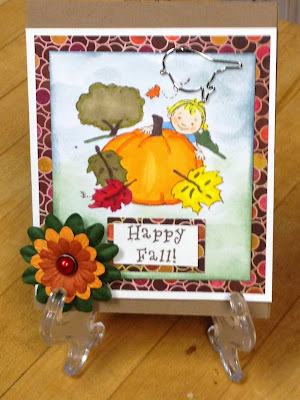 I love Phyllis Harris' fall themed stamps! Love PH too, this is such a great seasonal card, nice work! Great coloring on this cute card! What a cute card! And the colors are so appropriate! My backyard are these colors right now. I love Fall also. This is just precious! Such a cute fall card! The card is so cute! I love the PH stamp. Great coloring on this. I love the colors of Fall, too. So Gorgeous!! Love the fall colours. Such a cute fall card. Love that image. Thanks so much for celebrating STAMPtember® with us and playing along with the Stamp It Challenge over at the Simon Says Stamp Wednesday Challenge Blog this week!